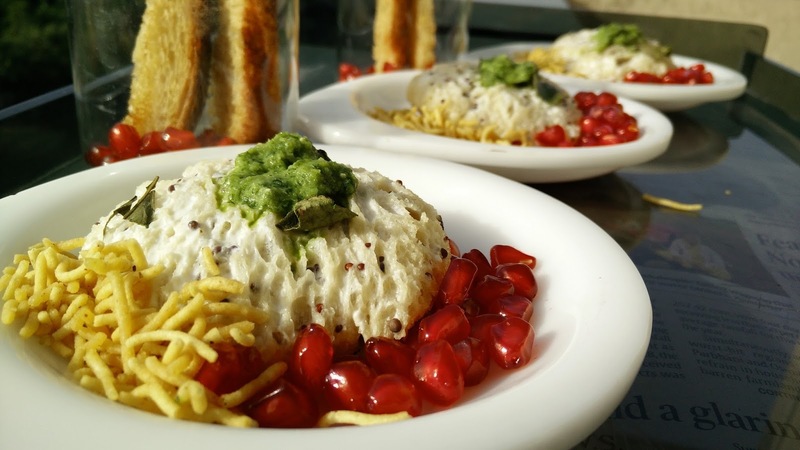 This is a very interesting snack recipe as, though we named it idli but we will not be using any idli batter or semolina to prepare Instant Idli. Bread slices and potato cutlets are used to give a idli like shape and appearance. Another quick and innovative snack!!! Mix mustard seeds in curd and keep aside. In a nonstick pan, place a cutlet and put a round slice of bread on top of it. Spread 1-2 tsp of curd on the bread slices in such a manner that the sides are pressed to give a shape of idli. Let it cook for 5 min on medium flame. Simultaneously prepare all other bread idli like this. Ensure not to cook the top of bread slice else the colour will change. For serving, place all idlis in serving plates and top with a little coriander chutney. Add pomegranate seeds and sev at sides of the plate. Also the left over bread can also be toasted in non-stick. Coat the tip of the bread with both cutney and coat with sev or bhujia. These sticks will complement the snack.